Celebrating female artists working with glass, the Bergstrom-Mahler Museum of Glass in Wisconsin has opened a new exhibition, "Sharper Edges: Women Working on the Edge of Glass." The artists in this exhibition grapple with social issues through their work, expressing their views on politics, gender biases and the environment. An art form largely dominated by male protagonists, glass has a somewhat hidden female history of subtly powerful influence. For more insight into the background of this exhibition, The Glass Quarterly Hot Sheet spoke with the museum's director, Jan Smith, and with exhibiting artist Audrey Handler. Handler is a former student of renowned glass artist and teacher Harvey Littleton, and is referred to by Smith as the "grande dame of contemporary glass." 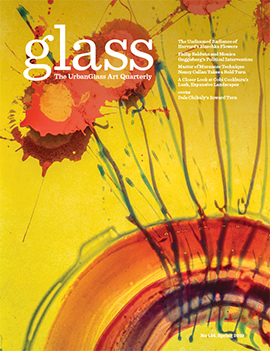 Glass Quarterly Hot Sheet: What was the impetus for this exhibition? Jan Smith: Although there is some concern in the arts community about identifying women artists in a way that seems to segregate them further, there is also reason to emulate their accomplishments in a year that has focused on women's initiatives and wellbeing. About two years ago, Audrey Handler mentioned an inquiry she began with the National Museum of Women in the Arts in Washington D.C. about glass representation by women in their collection. Apparently, women were under represented and the broad spectrum of their work by women in this medium was lacking. Audrey Handler felt compelled to do something about it and asked if I would consider helping with an exhibition proposal. Glass: Is there a reason why you chose to put on an exhibition on female glass makers at this particular moment in time? Smith: I have always considered working on an exhibition about women artists who use glass as their medium. Bergstrom-Mahler Museum of Glass grew from an extraordinary paperweight collection, astutely collected by a woman who became a world renowned expert. The glass she collected was made primarily in factories by men, with a few additions by women who would add painted decoration or strengthen design elements. There were a few women making paperweights alongside their husbands in the mid-twentieth century and then, by the 1970s, a few more women making flame-worked paperweights with encased designs. Yet, for the most part they were working isolated in their studios. There were women working in glass prior to Audrey and also under Harvey Littleton. Edris Eckhardt and Frances Higgins were among a handful worldwide. Glass: I learned that around when Audrey Handler began to create glass art, there was a strong machismo culture surrounding the medium. Do you feel that culture still exists in the glass world? Smith: Things have changed considerably in the glass community and I believe the artists would like to be considered just artists rather than "Women Artists." However, to their admission, since there seem to be a number of exhibitions on the theme, and we have gone through a year of still identifying women’s issues, there is work to be done before all areas are equalized--whether it is in art, business, entertainment or politics. Glass: Do you have anything specific to say in praise of Handler and her works in the show? Smith: Audrey was among the first artists working in glass who explored mixed media successfully and was challenged by purists in the field. 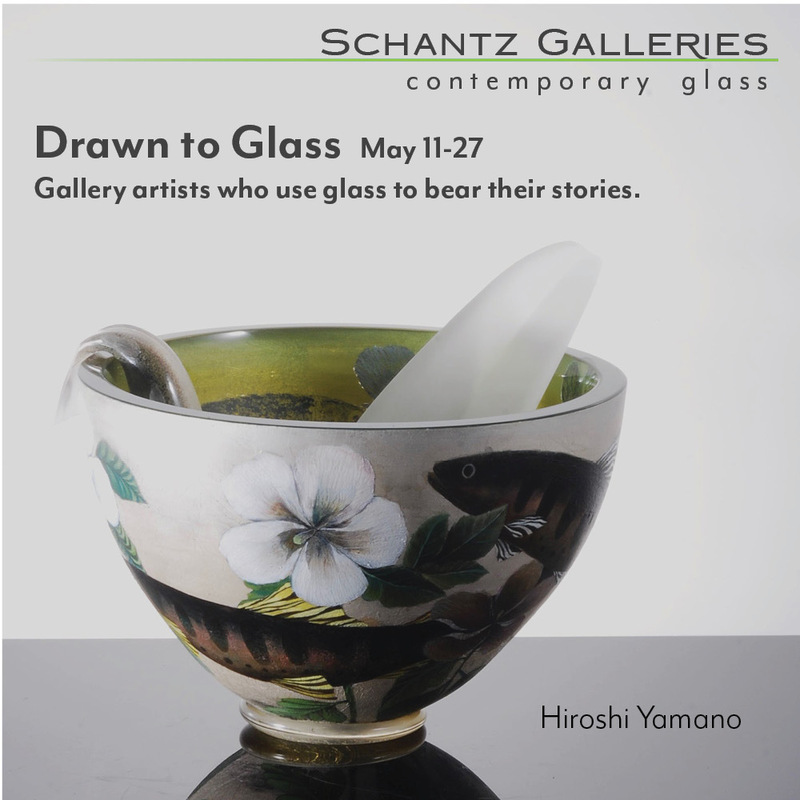 She is featured in this exhibition as the grande dame of Wisconsin glass, and one of the first women taking the studio glass classes as a student of Harvey Littleton. She is among those who paved the way for the others working in their studios. She also has possibly one of the oldest operating glass studios in the United States. She built her own studio and furnace in an old nineteenth-century cheese factory in Verona, Wisconsin, that is still open for Fall Studio Tours. She's really keeping these memories alive. ***(Glass Speaking)Handler's reputation is by no means limited to the fact that she is a successful woman working in glass. Her work is unique aesthetically and conceptually and challenges the medium's norms. Handler creates a surreal time and place through illusion as she plays with scale and mixed media. The objects she creates are symbolic and allegorical yet somewhat bizarre and very humorous. The scenes they make up are miniature worlds that often include pieces or bowls of fruit made from glass. The fruit is symbolic of domestic life and maternity. Glass: Audrey, your work has been described as creating surreal time and place and as speaking to universal experiences often linked to being female and to domestic life. Could you explain this in more detail? Audrey Handler: I am a story teller and like to work with illusion and surrealism. I usually have a theme but I like the viewer to look at my work and bring his or her own interpretation and experiences to my art...These sculptures are small worlds and landscape portraits with life-sized objects and sometimes tiny cast sterling silver and gold people. The fruits are life-sized and super real, the people small, the tables and chairs are tiny which I hope creates a surreal landscape. I hope the viewer will look at my work and see something of themselves and perhaps be reminded of their own life experiences. I think Paul Gardner, curator emeritus of the Smithsonian Institution, nailed it when he said that I put "real life into still life" and Bruce Pepich, director of the Wustum Museum, stated that I am "transforming scenes and objects from daily life into surrealistic theater …. where people dash around amid giant fruit and tableware". Glass: Can you tell us more about some of the specific work in the exhibition? Handler: One piece, typical of my work, is called Pears and is a symbolic table with a play on words "Pears and Pairs." People going about their daily lives. The pears are life sized but the figures of couples are small to make the objects look gigantic. A surreal landscape of pears and pairs of people. Another titled, Bowl of Fruit, Monument in a Park, presents a bowl of fruit as a monument in a park symbolizing motherhood. The people are all going about their daily lives. The fruit and bowl are life sized but the figures are small to create the illusion that the bowl of fruit is a monument. 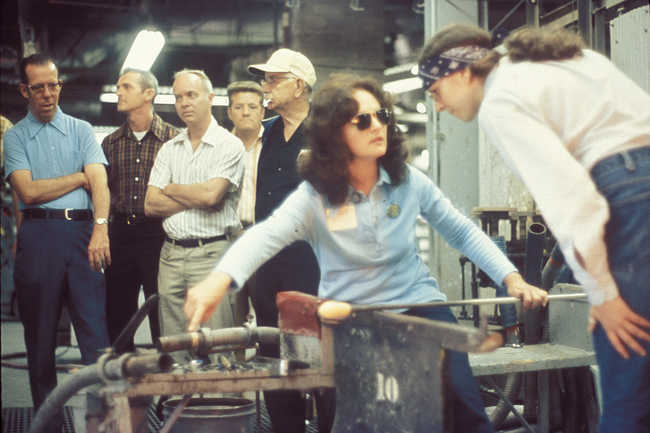 Glass: How were women treated during your early days of working in glass? I learned that there was a strong Machismo culture at the time surrounding the medium. Would you say that this has changed since the days you were studying under Harvey Littleton? 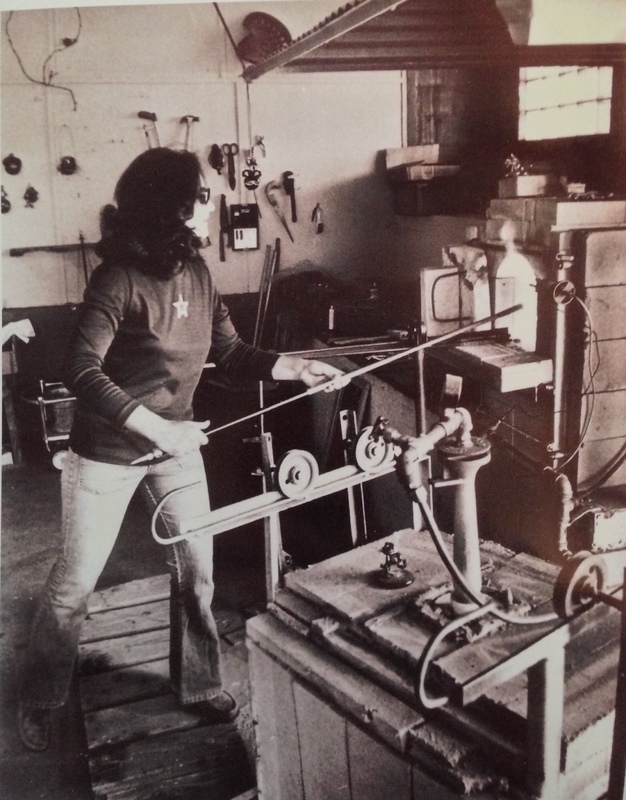 Glass: Would you say that female glass artists connect with the medium in a way that is different from men because of historical associations between craft and domesticity? Handler: Female artists have a special connection with this medium. Every woman I speak to loves making glass on a personal level. It sings to them. It lets them create a narrative about their lives and experiences. It is kind of close to cooking and making things happen. They love it with passion and revel in its ethereal quality of luminosity, transparency, opacity, vivid color, or lack thereof, and not least its sensual quality. Glass: Does any of this content come as inspiration you take from your surrounding rural landscape? Handler: I paint with low fire glass paints and fuse them on tiles, creating landscapes of the prairie seen from my studio window. Areas around Wisconsin and visions of landscapes from my many travels, has been a recent addition to my work in glass. These glass paint paintings are an extension of my work with blown glass extending more than 53 years, as well as a return to my roots as an oil painter. Our studio is an old renovated cheese factory with posters, photos and lots of space for my creative work. My glass blowing studio is on the first floor, my husbands wood shop and my painting studio are on the second floor. "Sharper Edges: Women Working on the Edge of Glass"